FREDERICKSBURG, VA, UNITED STATES, January 18, 2019 /EINPresswire.com/ — Nicholls Auction Marketing Group, Inc., (www.nichollsauction.com) announces that the Virginia Auctioneers Association awarded Kelly D. Strauss, CAI of Nicholls Auction Marketing Group its coveted Auctioneer of the Year Award at its recent 2019 Annual Auctioneers Convention held in Richmond, VA. 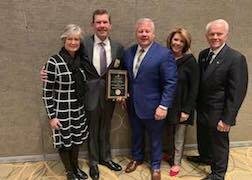 The Virginia Auctioneer Association (VAA) Auctioneer of the Year award recognizes an auctioneer who has tirelessly and unselfishly represented the auction profession, Virginia’s auction industry and the VAA. This year the VAA recognized Kelly D. Strauss as its Auctioneer of the Year for his steadfast and faithful dedication to the VAA. In comments made during the convention, Strauss stressed the importance of family in both his personal and professional auction lives and its importance for the entire auction profession. Strauss currently represents the auction industry serving on the Board of Directors of the National Auctioneers Association (NAA) and previously served as the 2015 Virginia Auctioneers Association (VAA) President. Strauss was instrumental in scheduling highly respected members of the auction industry to speak at VAA meeting during his tenure of the VAA Board of Directors. For more information about Kelly Strauss, the VAA, and the NAA, visit www.nichollsauction.com, www.vaa.org, and www.auctioneers.org. The Virginia Auctioneers Association (VAA) represents Auctioneers in the Commonwealth of Virginia. Founded in 1959 the mission of the VAA is to promote the auction method of marketing and enhance the professionalism of its members through education and technology. To learn about auctions in Virginia, visit www.vaa.org.